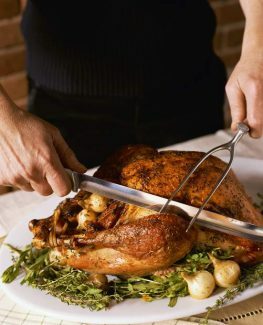 Our turkey this year will be a locally grown Heritage turkey (20 to 25 pounds) from Nancy’s Green Barn Farm in Dayton. The recipe I’m giving you is for a 16-pound turkey. I like to give 15 to 20 minutes per pound roasting time, making sure the bird’s internal temperature is between 165 and 170 degrees. It has been deemed by the various agencies stuffing the turkey is of great concern due to bacteria that can form in the cavity, due to incorrect temperature application. The school of thought is to fill the turkey cavity with herbs and vegetables, and cook the stuffing in a casserole dish. That is what I do. 3/4 cup walnuts, halved (I like to roast them in the oven at 350 degrees for 20 minutes). When brining the turkey, it’s important it’s rinsed thoroughly after removing it from the packaging. The neck, gizzard and liver must be removed, rinsed and set aside for making the turkey stock, which is needed for the stuffing and gravy. To make the stuffing, buy a large round sourdough loaf. They’re about 1 1/2 to 1 3/4 pounds. Remove the crust and cut it into squares. Place the bread in a baking pan and then, in a 325-degree oven for 30 to 45 minutes, dry the bread. Don’t dry it so much it resembles a crouton. You don’t want it that hard. When the bread is done, place it in a large mixing bowl. The making of the gravy is done at the last minute. You’ll use the remainder of the turkey stock, drippings from the roasting pan, 1/2 to 1 cup all-purpose flour, whipping cream, salt and white pepper. You’ll also need a six quart or larger saucepan and a one-quart measuring cup or large bowl.